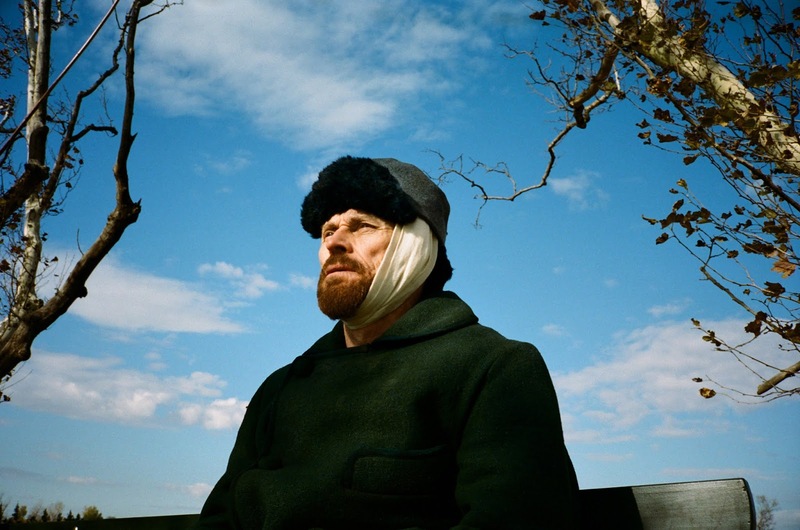 In At Eternity’s Gate, the new movie about the final years of Vincent Van Gogh’s life, director Julian Schnabel, working from a script he co-wrote with Jean-Claude Carrière and Louise Kugelberg, chooses to go for an unconventional take on the artists’ life. As stated in interviews, instead of focusing on a fact based sequence of events Schnabel decided to give viewers a peak into the creative process through a fictionalized account of the events, though this intention doesn’t come across clearly in the final work. The film begins with an entirely black screen while Van Gogh (Willem Dafoe) speaks. Similar moments of nothing but dialogue are scattered throughout the movie giving breaks to the flow of what little narrative there is on screen or as a segue into the next vignette. It’s as if Schnabel wants to give the audience a chance to hear Van Gogh’s internal dialogue but these moments, instead of leading to the subject in thought or speaking to himself, lead to scenes where characters are in conversation. In general, odd editorial choices and filming techniques are the storytelling device of choice for this non-biography. The camera starts to feel like its own character as it is used to try to insert the viewer into Van Gogh’s world – whether it’s by way of his point of view, as a part of the conversation, or in an attempt to give insight into his state of mind. An exchange between Van Gogh and Paul Gauguin (Oscar Isaac) toward the beginning is photographed using a handheld camera, veering between the two as if viewers are walking down the street with them. This shaky handheld look is used throughout the movie - Dafoe is even given the camera at times to get shots from Van Gogh’s point of view. Whenever the handheld conceit isn’t used, other unusual techniques are. There is another sequence where Gauguin and Van Gogh are walking and talking during a break from painting. Throughout the scene, it is edited to new shots at times that seem out of sync with the flow of the conversation and the actor's delivery of the dialogue. Some scenes are shot with a lens that causes the top half of the image to be in focus while the bottom half is not and at one point a fisheye lens is used to film a walk through a field of dead sunflowers. Other scenes look like they are hastily shot in order to quickly capture the actors or objects being photographed. I can see what the director was going for, but it doesn’t work. These techniques that should help connect viewers with this world instead call attention to its unreality and further remove them from the movie. The hasty appearance can be explained as an attempt to mimic Van Gogh’s painting style as suggested by a scene where Gauguin reproaches Van Gogh for painting too quickly. A lot is done to attempt to show Van Gogh’s mentality, the already mentioned camerawork being only one of the chosen stylistic choices. Scenes are occasionally shot through filters to show his pain and sound is used to show his frustration. At times dialogue is repeated immediately after it is said and sometimes even repeated as it is being spoken by a character. The first usage of this comes after Gauguin tells Van Gogh that he is leaving Arles to emphasize the distress Van Gogh feels about this news. Ultimately, all of these devices serve as nothing more than a distraction rather than enhancing the delivery of the narrative. The physical introduction of Theo (Rupert Friend) into the story is also poorly handled. After a bad encounter with some school children Van Gogh ends up in the hospital. Theo arrives while he is there recovering and upon entering his hospital room quickly climbs into bed with him, where they lay like lovers. More accurately implying an incestuous relationship since Theo is his brother. Van Gogh’s sexual habits and identity are hardly ever mentioned (besides an earlier scene involving him suddenly offering to do a portrait for a man instead of the woman he was originally speaking to), making this scene even odder. There is a sequence about halfway through the movie where Van Gogh sits talking with a doctor (Mathieu Amalric). A shot of a gaunt Van Gogh, bandage wrapped around his head to cover his recently cut off ear, sitting in front of a garish yellow wall is followed by a shot of the doctor sitting in front of wood paneling, alternating between the two throughout the scene. The doctor is asking Van Gogh about his decision to cut off his ear and his plans for the severed appendage while Van Gogh, seeming calm and rational despite his actions, gives his reasons. Both men and their surroundings are given a slightly jaundiced look from the sun reflecting off the walls. This is one of the few conventionally handled scenes and one of the few moments where everything clicks together – clearly showing Van Gogh as a tortured individual. If Schnabel’s intent was to make a movie about the creative process why use such a famous figure as the film’s central focus? Wouldn’t it have been better to instead use a fictional person? To be perfectly honest I was not expecting much from this movie, besides hoping to see an excellent performance from Willem Dafoe, which wasn’t delivered. Dafoe never became Van Gogh on screen in my eyes. Instead, I was all too aware that I was watching someone play a part. As it stands, At Eternity's Gate comes across like some pretentious student's experimental art project.